Nearly 1.5 million homes are broken into each year. But only 17% of homes have security systems installed. I understand that for one reason or another, not everyone can have (or afford) a security system. However, that shouldn’t stop you from doing everything you can to prevent burglars from trying to break into your home. In fact, what I recommend you do is fake it. That’s right, fake having security measures in place, or that someone is home. Homes that have security systems in place are 3x as less likely to be broken into. So although you won’t get all the benefits of a true security system, looking like you do will go a long ways. So here are 5 (easy) things you can fake to improve the security in your home. 1. Use Stickers & Signs – One easy thing to do is to place stickers and install signs on your windows and property. Statistics show that burglars don’t want to spend more than 60 seconds trying to break into your home. However, if you give them the idea that you have a dog on guard or that you have a security system, that’s going to scare many of them off. You can pick up signs nearly everywhere, and stickers from companies such as ADT can be purchased online (here are some on Ebay). 2. 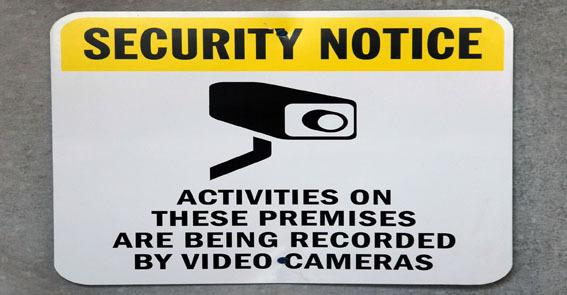 Fake Cameras – Fake security cameras give potential burglars the idea that they’re being recorded. It scares them off because the camera makes it more likely that they will be identified and caught. Security cameras can be purchased for under $100, although this will depend on how many you need. I suggest placing them around all entry points and windows that are most likely to be broken into. One piece of advice — be sure to add wires or wire protectors to your cameras. A lack of wires is one tip off that your cameras are fake (wires -going into the home- give the illusion that they are real). 3. Cars in Driveway – If you’re away, something that you should do is leave a car or two in your driveway. This gives the impression that someone is home, which is something that a lot of burglars don’t want to deal with. If you only have one car and you need to leave long term, such as vacation or work, then maybe you could ask a family member or neighbor to park (or leave) their car at your place. 4. Leave the Lights, TV, Radio On – Same thing as number 3. By leaving the lights, TV and radio on, you give the impression that someone is home. I also suggest having your outside lights on a timer so that they can come on when you’re gone (you don’t want to turn them on and leave them on all day — that makes it obvious). 5. Newspaper & Mail – Once again, by having your mail and newspaper picked up, would be burglars think that someone is home. If you’re going to be away for a while, you can have your neighbors or family members pick up your mail. Another option is to have all deliveries postponed until you get back home. Granted, these tips may not prevent every burglar from trying to break into your home. But given that they could decrease the chances by nearly 3x, I think these tips are worth trying, especially given the (cheap) costs and how easy they are to do.